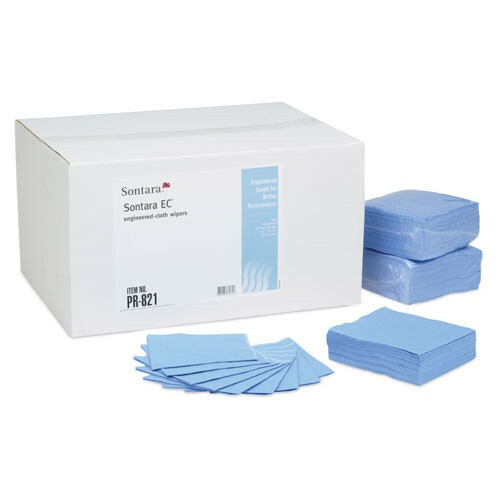 Clean up rags and cloths are an essential part of the daily duties in any household, office, or medical facility, and Blue Sontara EC Wipes have been proven to be more useful in more situations than cloth rags, more durable than paper, and more affordable than both. Ideal for various cleaning applications, these wipes can, and often do, transcend the medical industry they were designed for to be the leading wipe for people working in aviation, manufacturing, or in their homes, ant the creped wipe is strong enough to hold up to most industrial and all household cleaners. Creped Sontara EC 12 inch by 13.2 inch Wipes are strong and absorbent enough because designers know what they are doing. By creating a wipe with a creped fabric, a lightweight fabric with a finely crinkled or ridged surface, the wipes never fail when used with MEK, isopropyl alcohol, solvents, or household cleaners. A leader in the clean up rags and cloths market, the wipes in this Sontara EC Poly Pack, by HOSPECO made to handle the toughest cleaning by utilizing spunlaced, nonwoven fabric, technology to create exceptional strength and resistance to abrasion. Spunlaced, nonwoven fabrics are created through Hydro-entanglement -- a bonding process that uses high pressure jets of water to penetrate the original fiber. The jet then hit a hard surface or conveyor belt before it bounces back, resulting in the fibers entanglement.